In a hard-nosed performance, Melrose kept their dreams of back-to-back BT Premiership titles alive by knocking out Ayr at Millbrae on Saturday. Leading 10-8 at half-time, Melrose’s defence splintered after the interval as the home side showed a much sharper edge, pouring forward in attack to take a 20-10 lead through a pair of touchdowns from Dean Kelbrick and Robbie Fergusson, one converted by Ross Curle. The home side looked play-off final bound as the clock wound down, but a penalty try with 14 minutes remaining and a Murdo McAndrew score moments later turned the contest on its head and sealed a dramatic come-from-behind Melrose victory. “I thought the composure the guys showed and their never-say-die attitude was superb,” said Melrose head coach, John Dalziel, following the dramatic victory. 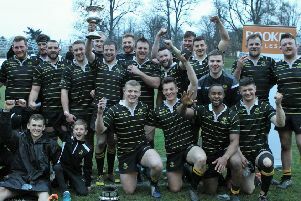 The Greenyards outfit, who are the reigning league champions, will take on Heriots in the final at Goldenacre on April 25, after the Edinburgh side triumphed over Currie in their semi-final clash. During the opening exchanges, Ayr looked most comfortable, racing into an early 8-3 lead following a Ross Curle penalty and Cammy Taylor touchdown, full back Joe Helps in reply for Melrose with a single three-pointer. The reigning champions eventually found their groove midway through the half, pinning Ayr back inside their own 22m with an attacking line-out. Powerful work by the Melrose front eight followed, pushing Ayr deep inside their 5m line and with holes appearing in a stretched home defence, flanker Grant Runciman spotted a gap and wriggled his way over, Helps converting. Ayr came out flying in the second 40 and were rewarded early for their invention when Kelbrick raced over from an attacking line-out before Fergusson doubled their lead after motoring up the wing untouched. Melrose summoned upon their reserves of character to turn momentum in their favour and, with 14 minutes remaining, were awarded a penalty try after replacement flanker Graham Fisken pulled down a smart catch and drive line-out move before McAndrew pounced on lose ball inside Ayr’s 22m line to score and seal a remarkable ’Rose victory.